Tarek Chemaly: On the Mashrou' Leila x Greenpeace collaboration! On the Mashrou' Leila x Greenpeace collaboration! Adonis have just been featured in the Dewar's White Label ad, also in the Lipton one (one alcoholic, one not - unless you consider Long Island tea), which left Mashrou' Leila with Greenpeace. OK, it might be a joke but there it is. 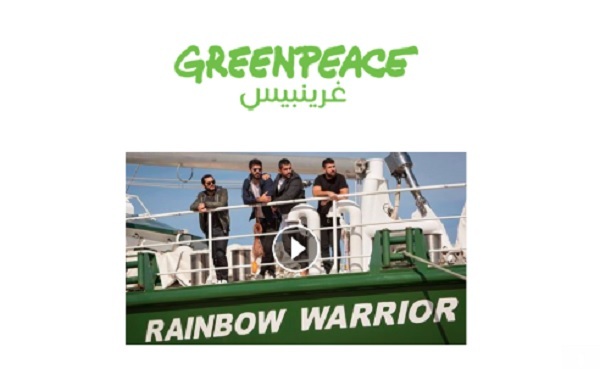 Mashrou' Leila issued a song which is all about solar energy which they performed live while sailing on the Rainbow Warrior III. I am not much of a music critic, but to me Mashrou' Leila peaked with their first hit "ra2sit Leila" (and I still have to see any clip outbeat what Yello Studio did for them on that song!). Of course for Mashrou' Leila to collaborate with Greenpeace is a very laudable effort, the merits of the song come far second. It is also a good way to propagate the solar energy efforts with "the sun unites us". Maybe it is me, but I try sometimes to understand how these things bring about day-to-day changes apart from media blitzes but kind of fail. Still any effort is a good effort I suppose, better than to sit and nag.